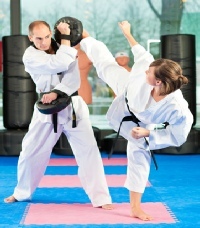 You may be interested in learning Tae Kwon-Do or improving your fitness, but can’t commit to a regular weekly club. An increasing number of people find work or family commitments make it difficult to take up a new activity. So why not train when you want? Private daytime classes are the answer! Whether you want to learn valuable self-defence skills or try a different and exciting form of exercise, you can arrange sessions at a time & place to suit you with a qualified instructor. We take all the best aspects of traditional martial arts training and combine it with energetic exercise routines to create an aerobic workout with a real kick! You will quickly see an improvement in your levels of fitness and flexibility and your confidence will build as your knowledge of self-defence develops. Some people want to train on their own. Others feel more comfortable with friends or a training partner. We offer classes for individuals and small groups. You can train at home or in the gym. If you have a place in mind then let us know and we can come to you. Alternatively we can suggest a location suitable for you.